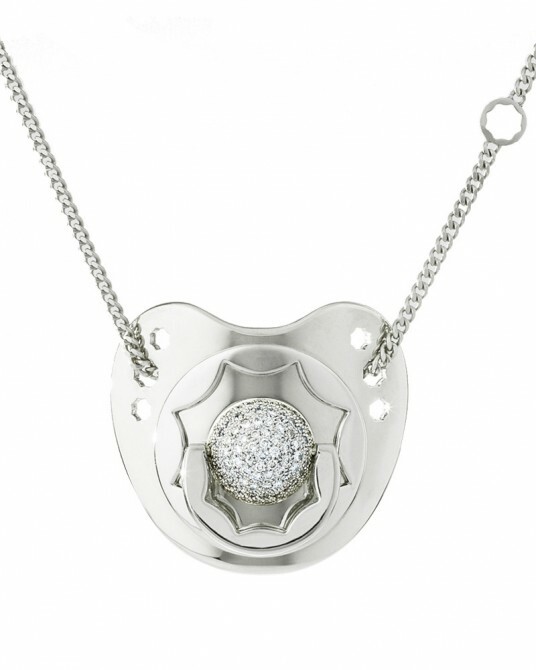 Find a wide range of Children's Jewellery to buy online at Suommo the Jeweller. Buy cot beds from Suommo in different finishes. 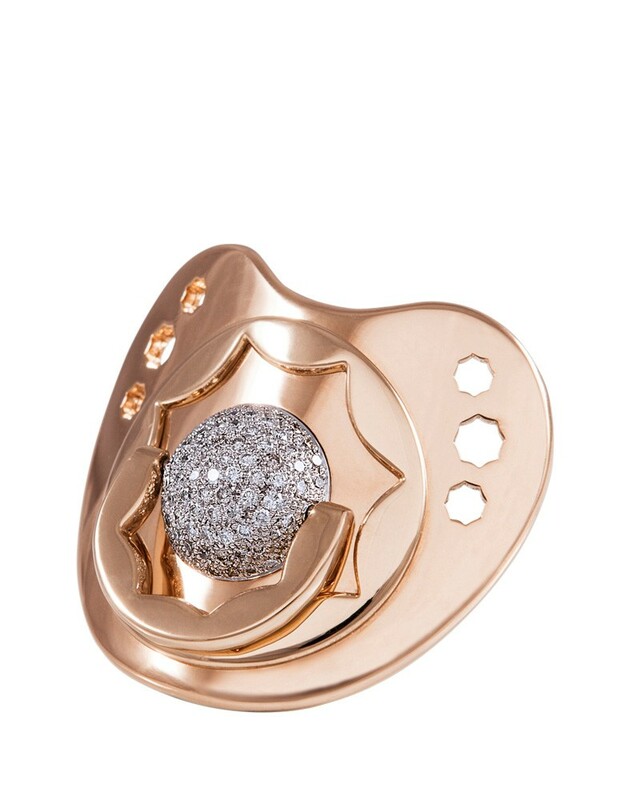 The world’s most expensive baby’s dummy. Maternity is the finest jewel, as it is made from the most powerful and shining raw material, ever to be found; love. This love has possessed our spirit at Suommo. This love has inspired the creation of an exclusive and luxurious collection, in which we convey the intense emotion of maternity… And we have created it especially for you and your baby. 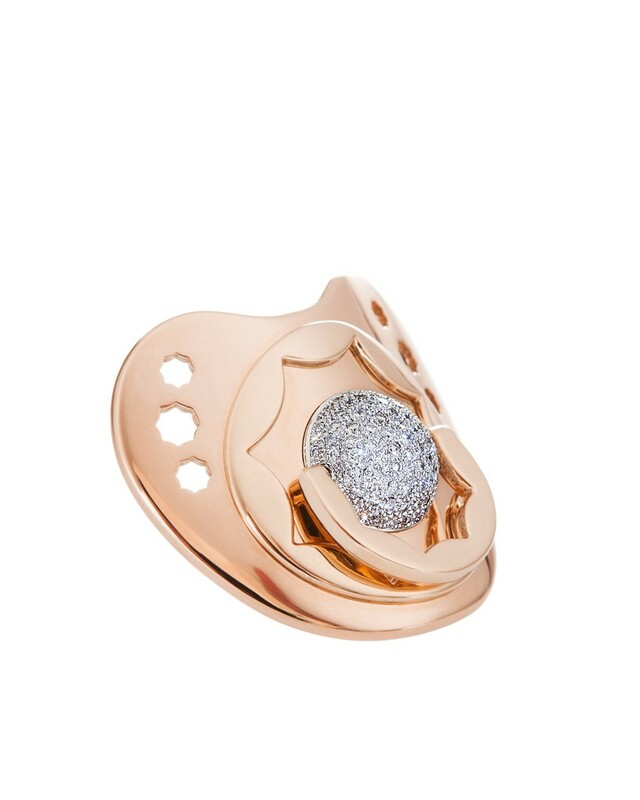 A subtle caress of pink gold embraces this pacifier, giving birth to one of our most tender and loving creations. 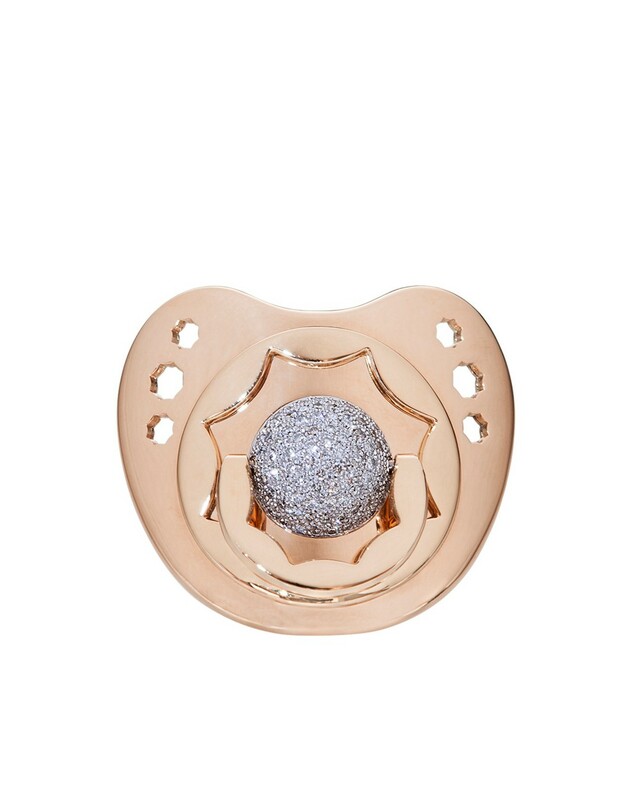 This pink pacifier ascends to the height of beauty, with shining diamonds on its surface. Devotion is transformed into a jewel, to lovingly welcome your new-born baby. 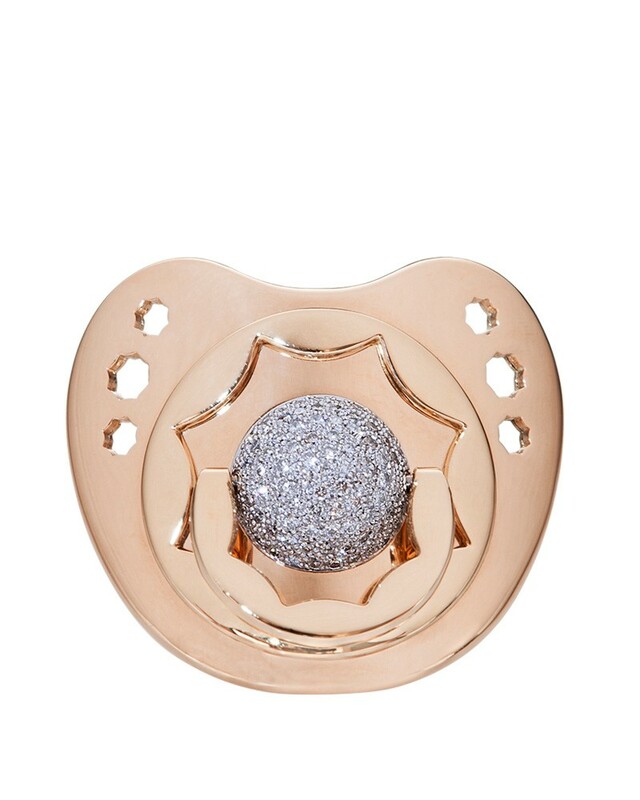 Your prince or princess deserves a unique welcome into this world; for this purpose, we have created this precious jewel, in the shape of a baby’s dummy. It is a delight for your senses that is entirely handcrafted in 18k rose gold and diamonds that you, the proud mum, will be delighted to wear. When withdrawing the teat, it becomes a splendorous clip or pendant, uniquely combining design and versatility. There is love in every creation. Hanging chain mum, baby chain, brooch accessory. International shipping insurance and worldwide delivery included. 100% designed and manufactured in Spain. 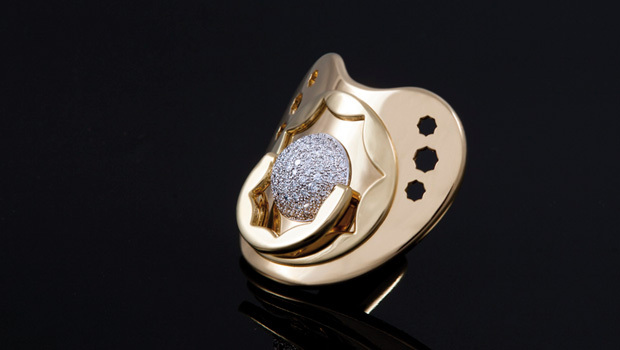 With Suommo’s renowned attention to detail, each creation embodies rare emotions and a unique baby story. 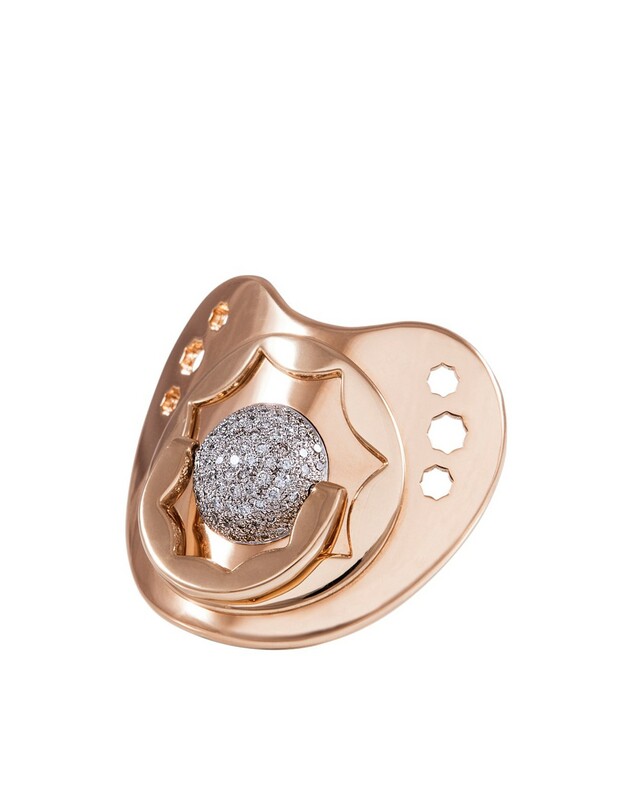 Our creations evoke a precious moment, in a very special way; through the high level finishing, their supreme elegance is iconic style for babies. Suommo is pleased to immortalise this treasured occasion, by providing for future special moments, with the opportunity to customise each creation with an everlasting and loving engraving. Eternal feeling, engraved in diamonds. Dreams cannot be made by mass-production. That is why we have created a very special and distinguished accessory for your baby’s crib, where you may lovingly engrave her name in diamonds. The perfect finishing will make your crib look the way you always dreamed of. Each art creation is a true ode to elevated jewellery that enhances the natural beauty in everyday objects. Each is a touching, heart-warming gift, to be kept in your memory, defying time itself. When looking at these delicate jewels, you will feel the latent intensity of eternal emotion. Our expert gemologists research and select the purest, most exceptional stones. Only gems that meet the very strictest selection criteria are chosen to feature in our creations. Our experts observe and consider the size, shape, colour and clarity of the stone, at different times of the day, under different kinds of light, selecting only those diamonds that sparkle with an incandescent spirit that makes hearts beat faster. At the end of the day, selecting diamonds is not only about applying the most demanding criteria; it is also about discovering the iridescent emotion that is hidden in only the finest stones. Each time an item is purchased from our collection, Suommo provides a verification “identity card” for the diamond, in the form of a certificate issued from the prestigious Gemological Institute. Completely independent from the diamond trade, this internationally renowned laboratory, guarantees the reliability and quality of the gem, according to an impartial and rigorous classification system, that is globally recognised, within the diamond industry. Suommo certification is recognized as one of the most univerally reliable guarantees of a diamond’s quality. Your Suommo diamond is precious. You may gently clean your diamond with warm soapy water, and a mild PH-neutral soap. Rinse thoroughly with clear warm water, then wipe gently and buff your diamond with a soft cloth. This quick and simple cleaning method will maintain the luminous shine of your diamond. Under no circumstances, should abrasive products, such as household products, be used, in order to prevent damage to your diamond. Finally, it is recommended that you isolate your diamond within your jewellery box, to offer the ultimate protection and care. Suommo adheres to the Kimberley Process Certification Scheme and the World Diamond Council voluntary system of warranties, which aims to put an end to ‘conflict diamonds’. What are ‘conflict diamonds’, or ‘blood diamonds’? These are rough diamonds, used by rebel movements or their allies, to finance armed conflicts against internationally recognised governments. These conflicts have devastating consequences for civilian populations: terror, injury, death. Examples include Angola, Sierra Leone, the Democratic Republic of the Congo (all are places of conflict and change over time). What is the Kimberley Process Certification Scheme? This is a system jointly initiated by governments, the international diamond industry, and civil society representatives, with the support of the United Nations, to put an end to the trade in conflict diamonds. It applies to all rough diamonds mined since January 1, 2003. In this system, rough diamonds travel in sealed containers, with numbered certificates, guaranteeing the diamonds are conflict-free. Participants apply the system to all rough diamonds they import and export. Participants include the EU and the US. These practices are subject to review. If any of the participating countries (69 to date) is found to be non-compliant, it may be barred from the diamond trade. What is the Voluntary System of Warranties? The entire diamond industry, through the World Diamond Council, has pledged its support to end conflict diamond,s with additional measures applying to diamond and jewellery manufacture and sales. All World Diamond Council members transmit the diamonds along the chain, with a statement of warranty, stating that the diamonds are conflict-free. An essential criterion, clarity, is defined by the number, size, nature and position of the inclusions (internal and external imperfections). A diamond is considered to have the highest level of clarity if no faults appear under a loupe which magnifies tenfold. Whilst almost all diamonds contain impurities, which alter their beauty and value, a perfectly pure diamond is extremely rare. The classification for clarity ranges from FL (flawless) to I3 (inclusions visible to the naked eye). Suommo expert gemologists retain only the purest diamonds; those in the category ranging from FL to VS-2. The weight of a diamond is measured according to a standard unit used throughout the world; the carat. One carat is the equivalent of 0.2 grams. A diamond’s value varies according to its number of carats and its rarity. The heavier the uncut diamond, the rarer it is. A diamond’s cut relates to its shape and proportions. The precise position of the facets plays a determining role in the diamond’s value. An ideally cut diamond works like a mirror; it captures the light and reflects it from facet to facet, before finally sending it through the crown. Each facet must be cut with extreme precision to reveal the gem’s full potential of brilliance. Suommo expert gemologists select only diamonds that are said to have an ideal cut. Suommo experts seek the perfect cut that best reveals the sparkle and brilliance of the stone. Only ‘excellent’ cuts are selected. Rose gold is also known as red gold in the world of jewelry. Its sparkling rose hue with purple highlights graces jewels with a luminous shimmer. 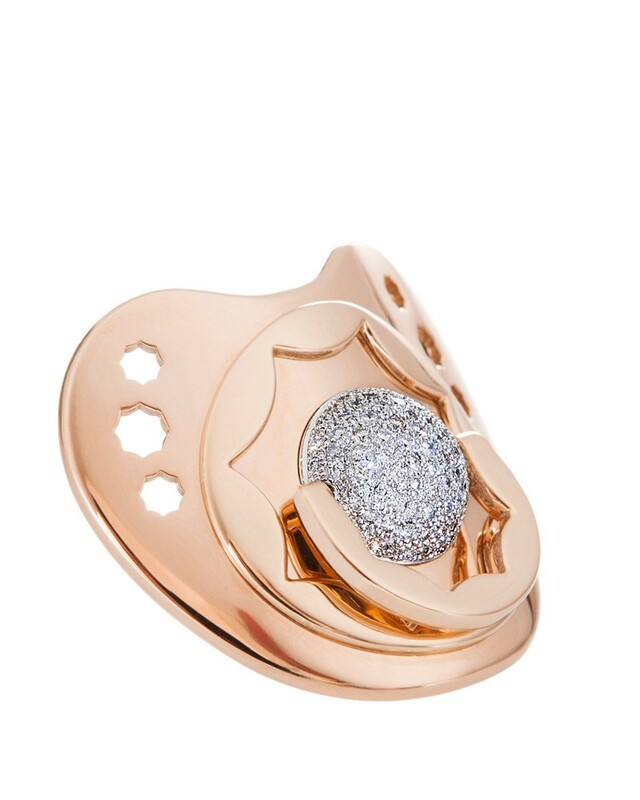 The 18-carat rose gold alloy used by Suommo is made up of 75% gold, 20% copper and 5% silver. This alloy has been specially developed by Suommo to maintain the unique beauty, color and sparkle of rose gold over time. To provide customers with a guarantee of the highest quality, Suommo’s jewelers stamp all gold jewelry with a hallmark certifying its purity. In Spain and throughout much of the world, this 18-carat hallmark and a scale of 750 thousandths.